I am so excited for this Early Chapter Books for Kids book list series! I am hopeful that it will be of great use to parents with children in the 6-10 age range. However, some of the books are great for 5 year olds, who are early readers, too. If your child is ready for an “early chapter book” he will have graduated out of the easy reader section of the library, but is finding typical “middle grade” chapter books too difficult for independent reading. I also have a list of tips to find early chapter books and. If you are new to this blog, you will also find my list of 50+ Chapter Books to Read Aloud to Preschoolers very handy for this reading level. Many of those books are appropriate here, but I am avoiding too much duplication between the lists. 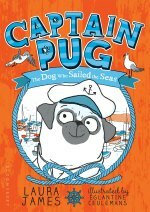 Captain Pug (series) by Laura James, illustrated by Églantine Ceulemans. A quirky and humorous series about a pug who lives with the charming Lady Miranda. The pair are off on a boating adventure, but poor Captain Pug highly dislikes the water, much preferring a tasty jam tart. Pug gets lost during the adventure, hatches a plan to be found but must overcome his fear in order to for his plan to work. 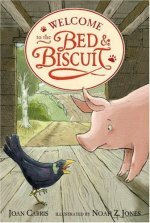 Bed and Biscuit by Joan Carris, illustrated by Noah Z. Jones. Grandpa Bender is a vet with a boarding house full of lovable, delightful and well-meaning animals. Hijinks ensue. Highly recommended. The Bad Guys (series) by Aaron Blabey. (Graphic novel, chapter book hybrid) I read the first book in the series out loud and my 8 year old and I could not stop laughing! He subsequently gobbled up the next two books on his own. 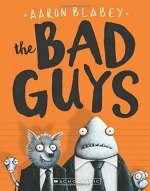 Mr. Wolf is on a mission to change his reputation and convinces his fellow reprobates, Mr. Snake, Mr. Piranha and Mr. Shark to join him in the Good Guys Club. Their first mission is to free 200 dogs from the Maximum Security City Dog Pound! Absolutely hilarious and extremely silly in the very best way. 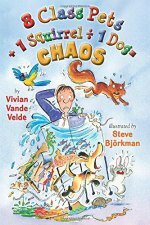 8 Class Pets + 1 Squirrel ÷ 1 Dog = Chaos by Vivian Velde, illustrated by Steve Björkman. 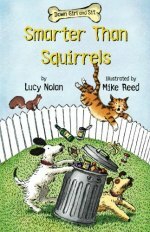 The story begins when a dog chases a squirrel into a nearby elementary school. The squirrel runs from classroom to classroom leaving chaos in its wake. Each chapter is narrated in the first person by the various class pets that inhabit the classrooms. The pets range from hamsters to snakes to fish to birds and getting their different perspectives on the ruckus is extremely entertaining to say the least. There’s now a sequel! Squirrel in the House. Down Girl and Sit (series) by Lucy Nolan. I found this series, narrated from the dog’s point of view (she thinks her name is “down girl” since she hears it from her master so often) quite amusing. Want to introduce your child to the concept of “dramatic irony” (i.e. when the reader knows more than the main character)? Start with this series. 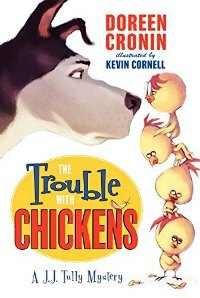 The Trouble with Chickens: A J.J. Tully Mystery (series) by Doreen Cronin, illustrated by Kevin Cornell. This series, inspired by hard-boiled detective novels, is perfect for kids who love tongue in cheek humor and mysteries. J. J. Tully is a retired search-and-rescue dog but when two plucky chicks promise him a cheeseburger in return for his help finding their missing siblings, he can’t resist. Be sure to read the spinoff books centering around the chicks: The Chicken Squad. Spunky Tells All by Ann Cameron, illustrated by Lauren Castillo. A truly delightful tale. Spunky contemplates the eternal mysteries of Humans, like why they know nothing of “Smellody” and how erasing is the most important part of homework. But when the family gets a new pet, Spunky forms an unusual friendship. Includes illustrations by the wonderful Lauren Castillo. 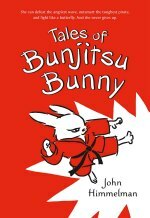 Bunjitsu Bunny by John Himmelman is composed of short vignettes about Isabel (the “Bunjitsu Bunny) and her friends (who also study martial arts). Each clever and funny vignette conveys a zen like lesson without being at all preachy. My then-6 year old was very into the idea of battles and fighting (Yes, I know!) so he of course wanted me to read a book in which the first action sequence involved head butting a door (they don’t actually get that far…) but I was delighted with the “sneaky” lessons in non-violence, friendship, compassion and self-discipline! 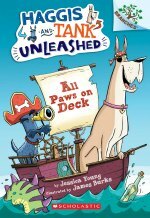 All Paws on Deck (series) (Graphic novel, chapter book hybrid) by Jessica Young, illustrated by James Burks. I was slightly skeptical about this series but my 7 year old was laughing his head off and so I picked it up and found the word play to be quite humorous. I’m a big fan of word play as a literary device; I think it gives kids a greater understanding of vocabulary. Haggis the scottie dog plays the straight man to Tank’s absentminded goof and together they set sail on an imaginary venture. This series, which is a graphic novel-hybrid, is a great choice for reluctant readers. 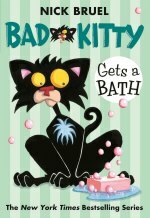 Bad Kitty Gets a Bath by Nick Bruel. This is a popular series and I never thought I would like it until I actually read it and laughed quite a few times. It’s garnered all sorts of praise from professionals. It’s heavy on the illustrations, making it a good choice for reluctant readers and includes lots of facts woven into the text, which will appeal to non-fiction lovers. Lulu and the Brontosaurus by Judith Viorst. Quirky is the name of the game for these two books about a gimme-gimme-gimmie girl who learns some valuable lessons about sharing and putting others before herself. Viorst’s (author of Alexander and the Terrible, Horrible, No Good, Very Bad Day) hilarious text is accompanied by great illustrations by Lane Smith. These books also make terrific read alouds, especially if — like me — you are into dramatics. 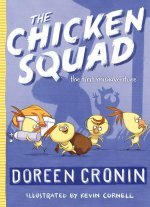 The Chicken Squad by Doreen Cronin, illustrated by Kevin Cornell. A funny series about Dirt, Sugar, Poppy, and Sweetie, chicks with varying degrees of intelligence who solve backyard crimes that inevitably involve the squirrel population. 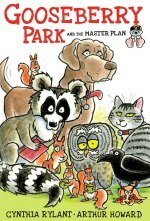 Gooseberry Park and the Master Plan by Cynthia Rylant, illustrated by Arthur Howard. This is a companion book to the wonderful Gooseberry Park novel, but written for younger readers. We adored both books. In this title, the colorful cast of characters ban together during a drought and come up with a plan that involves a cat, a possum, a raccoon, 200 owls, and 20 packs of chewing gum. 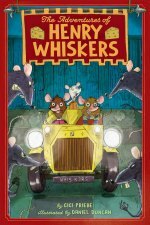 The Adventures of Henry Whiskers (series) by Gigi Priebe, illustrated by Daniel Duncan. The Whiskers mouse family lives under The Queen’s Dollhouse in Windsor Castle. When the dollhouse undergoes renovations, Henry’s sister goes missing and Henry is off on an adventure to find her! Maybelle in the Soup (series). I realize you think you could never love a book (much less a series) about a cockroach. But I dare you to take the challenge. Maybelle and her comic addiction to yummy food will win you (and your kids) over. 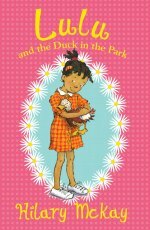 Lulu and the Duck in the Park (series) by Hilary McKay, illustrated by Priscilla Lamont. 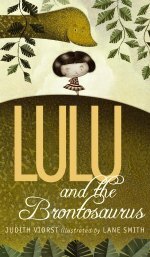 I really loved this sweet and funny story about Lulu, an animal lover who, unable to leave an abandoned duck egg in the park, hides it under her sweater and brings it to school. 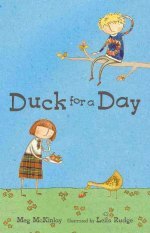 Duck for a Day by Meg McKinlay, illustrated by Leila Rudge. I highly recommend this extra-delightful story. Two classmates, Abby and Noah, vie for the opportunity to take care of the class pet: a duck named Max with some usual requirements. 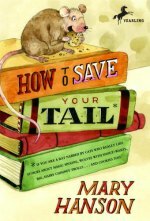 How to Save Your Tail*: *if you are a rat nabbed by cats who really like stories about magic spoons, wolves with snout-warts, big, hairy chimney trolls . . . and cookies, too by Mary Hanson, illustrated by John Hendrix. How’s that for a book title? Castle-dwelling, book-and-cookie-loving Bob the Rat extricates himself from all sorts of trouble with his talent for telling fractured fairy tales. The Lighthouse Family (series) by Cynthia Rylant, illustrated by Preston McDaniels. 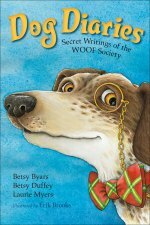 Rylant’s use of language in this charming series harkens back to back to classic children’s literature (think: Beatrix Potter and Kenneth Grahame) and when the stories end you are sure to feel all cozy and secure. 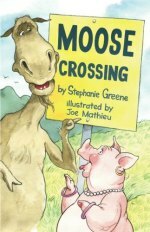 Moose and Hildy (series) by Stephanie Greene, illustrated by Joe Mathieu. A moose and pig may seem like unusual pair of best friends, but these humorous stories will keep your kids reading in this animal early chapter book. Socks. 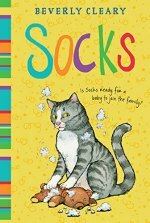 Socks narrates his own tale of life after a new baby enters his previously quiet home. It’s hard to go wrong with Beverly Cleary. Dog fans can pick up a copy of Ribsy. We also adored the audiobook! 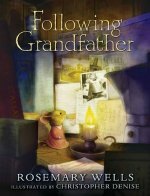 Following Grandfather by Rosemary Wells, illustrated by Christopher Denise. A touching story about a girl mouse who loses her grandfather and her journey towards coping with his absence. Or, see all my early chapter book lists here. So many new books to look forward to reading! My daughter isn’t quite ready for them yet, but I am pinning this away to use soon. If you find you just can’t wait, they make fun read alouds, too. 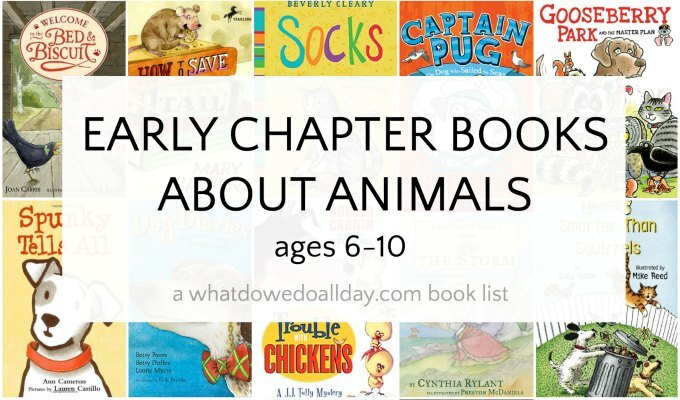 Great list of early animal reads. I love the Lulu books. So happy to see them here. Thanks, Valarie. The two different Lulus on the list couldn’t be more different but both were lots of fun to read. This is such a great list! My girls’ aren’t up to reading chapter books just yet but I’ll be looking forward to the ones we find when they are. I think I start collecting some of these in the mean time. Off to pin and share! Thanks Penny, some of these make terrific read alouds even if your girls are not independent readers, yet. Great list. We read some of the books, but far from all. I like the look of Cat Diaries. Will be checking those out at the library! Fabulous list! I’ve been looking for some good chapter books to read aloud to my girls; so many of these look like ones they would love. Yay! I love helping other parents find good books for their kids. Finding good chapter books is so hard I find, thank you for this wonderful list. I hope it’s useful to you! Come back next week for some more suggestions. Wow, I can’t believe this but I missed a Beverly Cleary book. I have never heard of or read “socks”. My school library must not have had a copy. She was my favorite author by far when I was growing up. This is a great resource, thanks. It’s not one of her best known books, but she’s written so many, it’s easy to miss some! Yay! I am soooooooo excited for this new series. This is perfect for our stage right now. Thank you! Hooray! It’s a great age for reading and fun to watch get excited about reading longer books. Thanks for helping us discover chapter books! Also followed your pinterest board .Perfect timing for us – we are always looking for the best chapter books with 2 avid readers. Yay! I love helping parents find books. I think I should have been a librarian. Yay for more book ideas! We’ve only read the Bad Kitty books and Duck for a Day so are looking forward to trying the others. 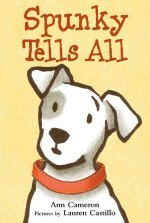 The Selby series by Duncan Ball (about a talking dog – there are about a million books in the series) was very popular with the kids in my older son’s class this year (Grade 1), especially the boys. My son didn’t like it much though so it’s obviously not for everyone. He has very definite tastes – he loved Duck for a Day so much that he took the copy we borrowed from the local library to school and insisted to his teacher that they have it for their class read-aloud. When she said that she couldn’t keep it in the classroom long enough because it needed to go back to the library he suggested that she copy the text out by hand! Luckily, she located a copy in the school library – much easier than transcribing it all! What a great story, Jen! Thanks for sharing it with me. 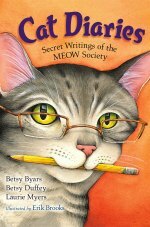 As part of this year’s Cybils, I discovered Following Grandfather (I do love Rosemary Wells) … I’d also recommend Maggie and Bramble (girl and horse), as well as Mr. Putter and Tabby by Cynthia Rylant. It might be too easy for some, but is on par with Annie and Snowball. 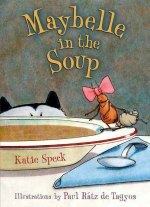 Here is a review of Mr. Putter and Tabby Feed the Fish from one of our families at the Reading Tub: http://thereadingtub.com/childrens-book-reviews.php?book=MR-PUTTER-AND-TABBY-FEED-THE-FISH-by-Cynthia-Rylant. Thanks, Terry. I love all those books that you mention. They are in the easy reader section of our library but the boundaries between all these reading levels are so fluid (I’m not an expert!) that I’m glad you mention them. The Mr. Putter and Tabby series is one of our favorites. Great list! It’s so hard to find easy chapter books! Pinned it and tweeted it! I’m excited about this new series of yours! This list is great; Socks is the only one N. has read. I hope you find a few book selections that he likes. I’m excited to see what lists you come up with! I’ve found this genre to be tricky as Claire will self-censor if the type is too small or if there’s not enough pictures. I find that’s true for my son, too. The first literary cockroach I fell in love with was “Archie and Mehitabel” by Don Marquis. Archie is the cockroach and Mehitabel is a cat. I’ll have to take a look. thanks for the suggestion, Mary. Hello Erica… My name is Linn Reights, children’s book author, I recently submitting a book to a literary agent from my children’s book series. The feed back that I received was “my book didn’t clearly define which age group it was targeting Middle Grade or Picture Books.” The agent suggested that I either add more character and scene descriptions for Picture books or turn the animals in the book (series) into humans for Middle Grade readers. 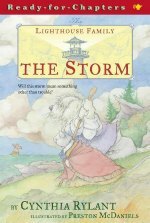 But with MUCH JOY I came across your blog about early chapter books for children that are designed to introduce chapter books (novels) to beginners. In the blog you mentioned the use of animals as main characters in the early chapter books. (This has given me hope for my books) I’ve been researching how to write an early chapter book but most of the articles I’ve come across state that animals shouldn’t be used in chapter book novels (not early chapter books). Could you recommend some tips on what would be good guidelines to use when writing early chapter books? Or should I just follow the chapter book guidelines and ignore the advice to not use animals? Linn, I’m not really qualified to give advice to authors, having never worked as an editor or in the publishing industry. Our librarian suggested the Claude books to my animal book loving son and wow did we giggle! Funny stuff with great illustrations that can be studied over and over! Thank you for this list. My 3rd grader needs a book report book with an animal as the main character. She’s not a big reader, so the books I thought of at first, like Bunnicula or the Criket in Times Square are too advanced or may not keep her attention. The books you’ve listed are perfect! She will love them. They’re at the right level and are entertaining enough to keep her reading. I’m so glad I found your list! I’m so glad the list is helpful! 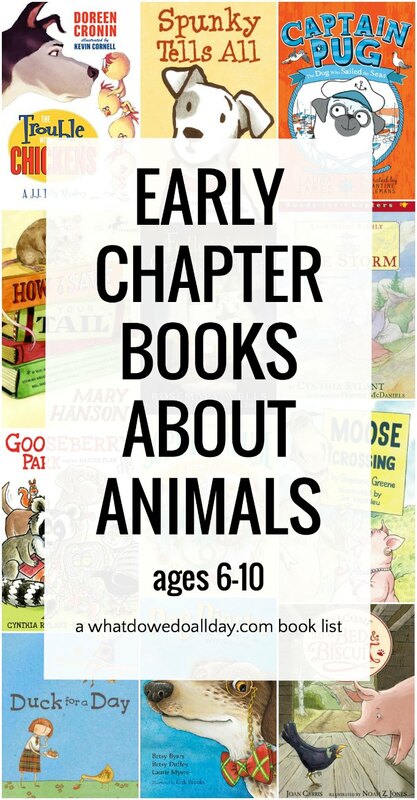 I just typed “early chapter books animals” into google and came upon your amazing website! Thank you SO much. This list is so perfectly targeted for my animal loving 7 year old. I desperately want to spend this summer helping her transition out of the early reader books and into chapter books, but even as a former teacher, I was struggling to find easy enough stuff for her. We read two Lulu books last week (one from each series) and started Down Girl and Sit tonight. They were all total hits! I just requested from the library about 15 more from this list and another on your site to get us through the first few weeks of summer. I’m so excited! Thank you so so much! Looking forward to exploring the rest of the site! Wonderful! I’m so glad you found some books you like! Happy reading. Fantastic list, thank you! My youngest is just starting to read at this level and now I have some new ideas. She particularly loves The Lighthouse Family series. It’s so lyrical that she’s able to stretch her reading skills and doesn’t get frustrated because she loves them so much and wants to read the beautiful phrases. 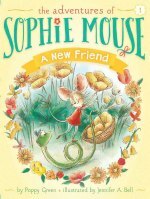 We are also working our way through the Sophie Mouse series, which is probably her just-right level. She’s reading these books aloud to us now and is just on the cusp of reading them silently to herself. So glad to have more things to try out on her!